About Us | Historic Cabarrus Association, Inc. Historic Cabarrus Association, Inc. is a 501(c)(3) nonprofit organization formed in 1973 by local citizens who were passionate about the preservation and restoration of the Historic Cabarrus County Courthouse (left). The original Board of Directors, along with the originators of the Old Courthouse Theatre, was responsible for saving this wonderful historic treasure from demolition. 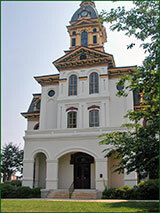 The Concord Museum, originally known as Memorial Hall, was founded in 1939 when the Concord City Aldermen requested that the Coltrane-Harris Chapter of the United Daughters of the Confederacy create a home for artifacts, documents, and books of historical significance to the community. 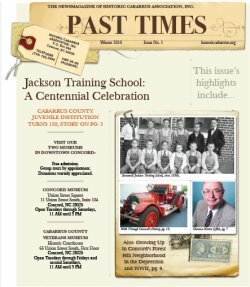 On June 26, 2007, Historic Cabarrus, Inc. and The Concord Museum merged, becoming Historic Cabarrus Association, Inc. We have begun a mission to find a permanent home to showcase historical collections, memorabilia, and a library of antique books, photographs, documents, and oral histories from all of Cabarrus County. Since the merger, The Concord Museum has expanded its hours from two to four days a week, has introduced rotating special exhibits with guest speakers, and has opened a sister museum, The Cabarrus County Veterans Museum. Historic Cabarrus Association, Inc. has also embarked on a mission of community outreach, introducing events again such as the Concord History Walk, special programs featuring reenactors, and guided walking tours of historic Concord. We also collect oral histories of our county’s veterans and honored citizens, and we co-create special activities with community partners including the Cabarrus County Public Library, Leadership Cabarrus, Old Courthouse Theatre, Residents of Historic Concord, and area veterans.